This creamy vegan pasta dish is something special! It offers amazing flavors and textures with good-for-you ingredients. 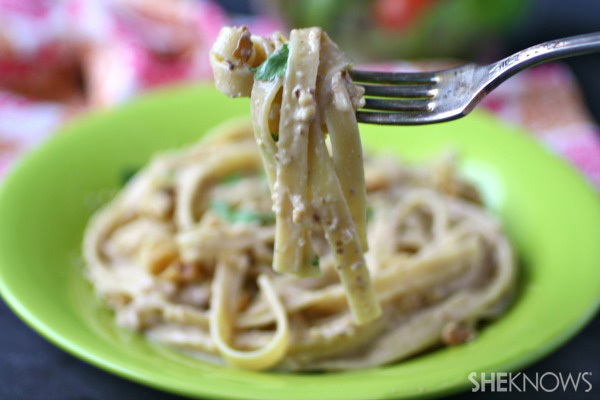 Vegan fettuccine with creamy walnut sauce is a delight for the senses. It’s rich but not too heavy, and it includes a generous texture thanks to walnuts. I can’t tell you how easy this sauce is to make. Without much effort, you’ll deliver an impressive dish that will soon become a favorite. You’ll find walnuts used in recipes for baked goods and as a garnish, but this recipe includes them as a main ingredient. I love walnuts because they taste great, but they’re good for you, too. Walnuts contain omega-3 fatty acids and antioxidants that can help protect you against heart disease, among other things. Enjoy this dish as a special-occasion meal, or as an delicious addition to your mealtime mix. Vegan foods are made without any animal or animal-derived products. Carefully check the packaging labels of food products you use for these recipes to ensure they are vegan. Add the soy milk and 1/2 cup of the walnuts to a food processor (reserve the remaining walnuts to use as garnish). Blend until smooth and set it aside. Add the olive oil to a skillet over medium heat. When hot, add the onion, salt and black pepper, and cook for 3-4 minutes or until the onions becomes translucent. Add the garlic and cook for another minute, taking care not to burn it. Add the vegetable broth to the onion mixture and increase the heat slightly. Cook, stirring, for several minutes until the liquid has reduced just slightly. At this point, add your fettuccine to a pot of salted, boiling water and cook according to the package directions. When finished cooking, drain it, but reserve 1/4 cup of the water. Whisk the walnut mixture into the onion mixture, and reduce the heat to low. Add the vegan Parmesan-style cheese if using it. Add the hot, drained fettuccine to the cream sauce and mix well. To thin the sauce slightly, add a bit of the reserved pasta water and stir. Season with 1/4 teaspoon salt and 1/4 teaspoon of ground black pepper. Serve warm on individual plates topped with reserved walnuts and torn parsley leaves. Indulge in this creamy sauce!